Huntington Beach, also known as Surf City, is a picturesque town with incredible walkability, sights, and a community that makes it all shine. The city has one of the longest continuing beaches in California where you can enjoy the surf during the day, and watch the sunset next to a bonfire at night. All city and state beaches close at 11:00 p.m., but don’t worry! There are plenty of great districts and neighborhoods featuring trendy bars that are open late to keep the good times rolling. During the daytime, there is also plenty to enjoy off the beach, including Central Park which is located on two sides of Golden West Street and is home to Central Library, the Huntington Beach Playhouse, a sports complex, Shipley’s Nature center, and much more! While you can expect this city to have an overall nautical vibe, you may be surprised by how vibrant and eclectic the neighborhoods are. Huntington Beach used to be made almost entirely of oil wells. However, once the wells dried up, the real estate comprising those dry wells was slowly sold off over time. This means the downtown area now has a wide variety of architecture styles from different time periods giving it a unique style all its’ own. Many residential neighborhoods of Huntington Beach surround small courtyards or parks and are encircled by brick walls. This added layer of security also provides a sound barrier to the beautiful, but busy, streets. While snagging one of these sought-after homes, or even finding an apartment to rent, may come with a hefty price tag, it will be well worth it. On top of everything else mentioned, you'll find abundant shopping opportunities, a low rate of unemployment, easy access to the 405, and a climate that will make you think you’ve died and gone to heaven every day. Before you start packing your bags, keep reading to gain more valuable insight on Huntington Beach, California! While your first instinct may be to check out all the awesome attractions that this city has to offer, you may want to take a look at the cost of living in the area to see if moving to this great city is within your budget. Important costs to consider include transportation, utilities, healthcare, groceries, housing, and goods and services. In the case of Huntington Beach, the two factors that show the biggest difference compared to the rest of California are housing, and goods and services. Compared to the state average of California based on all 5 factors, Huntington Beach’s cost of living is 22% higher than the average in California. If you compare Huntington Beach to the national average it is 69% higher. If you’re still ready to set sail knowing these sobering financial statistics, it’s time to get real about Huntington Beach real estate. Unless money is no object to you, you are probably going to want to find the most affordable home for your lifestyle and budget. In Huntington Beach, CA, the median price of a home is $659,700 and the median household income is $85,312. This means that the home-price-to-income ratio is 7.7, a ratio that is 21% higher than the average in California. If you plan on renting instead of owning in Huntington Beach, be prepared for the average rental to be 30% higher than the average rental price in California. The median cost of rent here is $1,686, so whether you rent or buy you’ll definitely want to make sure you have all of your financials figured out before you move! While the majority of Huntington Beach’s attractions revolve around coastal culture, there are still plenty of ways to enjoy the city without having to hit the beach every day. Beach Boulevard, or “Route 39” connects the sand to the freeway. Along this street, you’ll find restaurants like Johnny’s Saloon & Pizzeria, The Black Trumpet Bistro, and Baci Italian Restaurant. History buffs and the average curious person will enjoy visiting the Newland House Museum. Open for public tours, this historic home is the oldest and best-preserved in the city. Newland House Museum also hosts weddings and events in the beautiful Newland Barn located at the back of the property. If you’re more interested in what's trending now, the outdoor mall, Bella Terra, is the place to be. Located in the Goldenwest neighborhood, the mall has 1 million square feet of shops, fitness studios, and restaurants in addition to a cinema with stadium seating. For something completely different, why not step into a quaint Bavarian village by visiting Old World. There’s no doubt that Old World hosts one of Orange County’s best Oktoberfests, but year-round visitors can enjoy the regions only kava bar here, multiple German restaurants, bars, and German bakeries! Those who enjoy skateboarding should check out the Vans Off the Wall Skatepark located in Center Avenue. The park is open to the public and features bowls, rails, and ramps. BMX riders can also take advantage of this great space on Wednesdays as well! In addition to the skatepark, Huntington Beach is a paradise for all activities you can think of on the water or the beach. Rentals are plentiful here, and you can find lessons for just about any surf or beach leisure sport, so there’s no reason not to have a great time! Since these attractions are just a handful of the many terrific things that Huntington Beach has to offer, we recommend checking out the Huntington Beach visitors website to learn more, or just visiting and discovering the city in person! 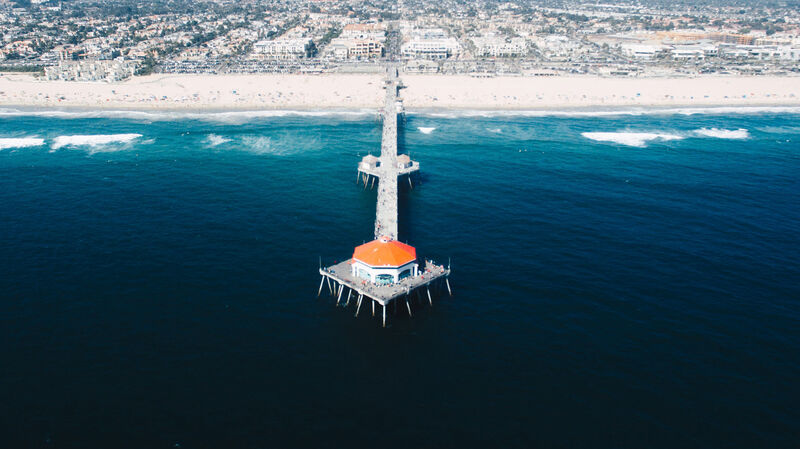 Huntington Beach is truly irresistible if you love the idea of being able to live in a totally walkable city that overlooks the sea and offers endless restaurant, bar, and entertainment options. While the cost of living factors may be startling for some, the benefits of living in such a desirable location outweigh those factors for others. If that is you, then let us help get you settled in! At A-1 Self Storage we specialize in self storage units, but also in making sure you have all the supplies you need for a successful move! Our facilities have a retail section where you can purchase all your packing and moving supplies including boxes, packing tape and peanuts, mattress bags, and more! At A-1 Self Storage, our friendly self storage professionals are prepared to help you step-by-step. From deciding on the best storage unit for your budget and needs, to when you’re ready to move out, they are there for you. All of our facilities are equipped with state-of-the-art security features and our self storage team takes pride in getting to know their community while providing top-notch customer service. Whether you’re moving across town or across the country to your new home in Huntington Beach, visit A-1 Self Storage on 17292 Gothard St in Huntington Beach, California or call and rent today!